The Caucasian dolmens represent a unique type of prehistoric architecture, built with precisely dressed large stone blocks. The stones were, shaped into 90-degree angles, to be used as corners or were curved to make a circle. The monuments date between the end of the 4th millennium and the beginning of the 2nd millennium B.C. They are situated in the foothills (about 250-400 meters above the sea level) along the coast of the Black Sea. This chain is the biggest conglomeration of dolmens in Europe. 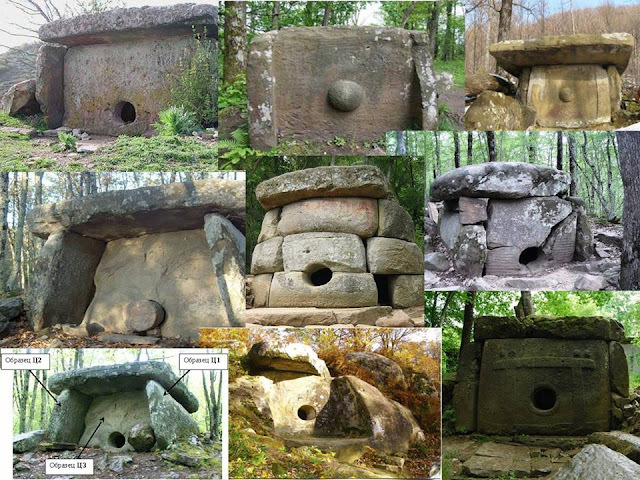 Approximately 3,000 of these megalithic monuments are known in the North-Western Caucasus, but more are constantly being found, while more and more are also being destroyed. Today, many are in great disrepair and will be lost if they are not protected from vandals and general neglect. All of the dolmens are punctuated with a portal in the center. Some are made of more than one stone, and others carved through a single stone. While round portholes are the most common, square ones are also found. Related to these are the stone plugs, which were used to block the porthole, and are found with almost every tomb. Sometimes phallic-shaped, the entrance of a Caucasian dolmen is always at the south-side (as with the Dutch Hunebeds). 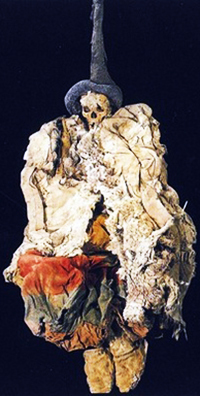 ‘Caucasus Mountain legend says that once upon a time there were giants in the Caucasus. they were kind and strong creatures, and as it often happens, there were small and spiteful people near them. they were sharp, cunning, whining and artful people who were driven away by their former neighbours for their meanness and treachery. the giants gave refuge and a part of their lands to them. They were so kind that they made stone houses for their guests and they carried them on their shoulders to the most beautiful and dry places, to the banks of rivers and lakes. Instead of doors they breached round holes through which little people went hunting on lop-eared hares. However the giants were repaid for their kindness. In order to tame the giants the little people blinded them and began to give them different herbs and because of it, the giants began to lose their minds and conflict with each other. Once the giants freed themselves from charms a war began, resulting in everyone’s death with just the stone houses remaining’. There is strong linguistic evidence to support the idea that Aryan priests and fortune tellers were present in the Shang and Zhou dynasty courts, probably in service to blonde haired Aryan emperors (Yellow Emperors) who ruled as the first emperors of China, over a subjugated mongoloid population. These ancient astronomers and priests were called Magi, the plural of the Old Persian Magus. 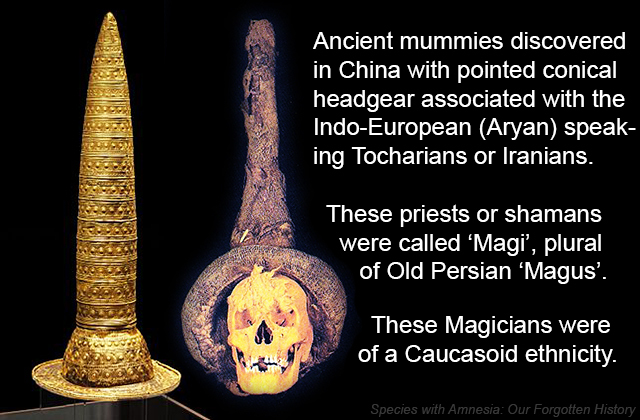 Archaeological and genetic evidence indicates that these Magi were of a Caucasoid ethnicity. Their conical headgear has also been associated with the Aryan steppe tribes. Theirs was a fire cult and they served a sky god. A recently broadcast television documentary [Museum Secrets] brought to my attention the discovery of ancient gold hats, one of which is on display in the Neues Museum in Berlin. Three others are in existence and all were found in Germany and France, indicating the existence of a Bronze Age solar cult in central Europe. So it would appear that the image of the pointed hat wearing witch or warlock is not as far fetched as it once seemed!